Property market cycles come and go, but with prolonged weakness, the current slowdown could point to a much larger economic issue. That the property market has been quiet for the past year is an understatement. A quick analysis of National Property Information Centre’s (Napic) data reveals that the severity of the slowdown has been in terms of both value and volume of transactions (see table). Last year, the volume and value of property transactions in the residential, commercial and industrial subsectors registered year-on-year contractions. Crucially, the contractions were in the double digits. In fact, 1Q2016 data released by Napic shows a similar trend. Total value of property transactions fell 17.9% from the previous corresponding period. On a quarterly basis, value of property transactions slid 10.7%. All subsectors — residential, commercial, industrial, agricultural and development — were badly affected. Maybank Investment Bank Research analyst Wong Wei Sum cautions that the slowdown in property transactions could be worse than expected, dragging beyond the typical two-year cycle. “The current situation is like a slow death by a thousand cuts, especially for those with weak financials or non-developers who jumped into property development at the peak of the cycle,” she says. Anecdotes abound on how weak the market has been. Since last year, property agents and valuers have been complaining about low volume of enquiries and deals done. The order of the day is still “wait and see” as potential homebuyers remain cautious. “Purchasing or investing in property has not been active in the last two years as people prefer to hold cash and maintain liquidity,” C H Williams Talhar & Wong says in its Property Outlook 2016 report. For now, it is anyone’s guess as to when the market will recover, but Wong reckons that there are no signs yet that things will improve in the second half of the year, as many would hope. “The market is still very slow and only a few projects, like affordable landed housing developments, are doing well,” says Wong. Low demand and weak sentiment due to ongoing economic uncertainties are just part of the equation. The other part is on the supply side, which indicates a bigger problem at hand. The first imbalance is that Malaysia’s property market is facing an undersupply of affordable housing (priced below RM250,000) and an oversupply of high-end homes (priced above RM500,000). Bank Negara Malaysia’s 2015 annual report, released in March, points out how acute the shortage in housing supply is in the affordable category. It relies on the Median Multiple methodology, which suggests that a house is only considered affordable if a household can finance it with less than three times its annual income. Given half of Malaysian households earned a monthly income of RM4,585 and below in 2014, houses priced up to RM165,060 are considered affordable to a median Malaysian household. But only 21% of new housing launches in Malaysia were priced below RM250,000 in 2014. Similarly, new launches of affordable houses accounted for less than 30% of total launches in the first nine months of last year. In contrast, there was an oversupply of properties priced above RM500,000. 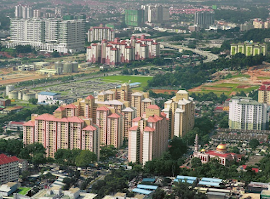 “Although property launches in this price category account for 36% of total new launches in Malaysia, these houses are only within the reach of 5.4% of the population, according to the same methodology,” says Bank Negara. Sunway University professor of economics Dr Yeah Kim Leng says unaffordability and the mismatch between supply and demand of affordable housing have a long-term impact on the economy with regard to consumer spending. “In the long term, if people spend more on property, then consumer spending will likely ease off. People could also have less disposable income. Another thing is that with fewer households being established, spending on consumer goods will decrease,” says Yeah. 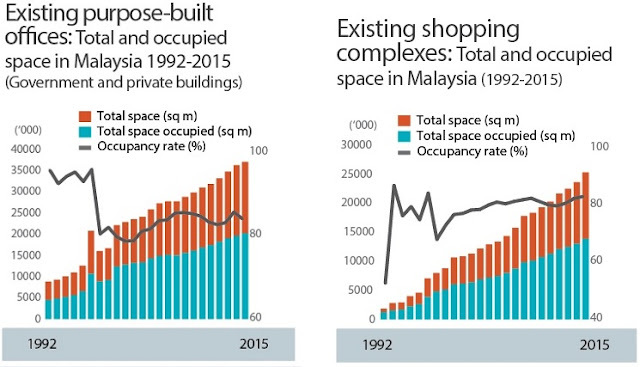 At the same time, there is an oversupply of office and retail space, particularly in major urban areas. The second half of 2015 saw cumulative supply of purpose-built offices in Kuala Lumpur and Selangor reach 92.5 million sq ft, according to Knight Frank’s Real Estate Highlights for 2H2015, released in February. Maybank Investment Bank Research’s Wong is also concerned about the huge supply that will come onstream from end-2016 to early 2017. “I don’t know how strong those buyers’ financials are. Depending on the location, it will take some time for demand to catch up with the impending supply of new properties. We expect to see more property auctions in 2016 and 2017,” she says. The dual imbalance — undersupply of affordable housing and oversupply of office and retail space — is at the heart of Bank Negara’s warning of potential negative spillovers from the property sector. “Both trends, if left unchecked, may lead to deeper imbalances in the property market, with negative spillovers to other sectors of the economy,” says Bank Negara. This warning is particularly urgent because these problems indicate a much deeper structural problem instead of a cyclical effect that comes and goes. According to the central bank, a sharp increase in vacancy rates may result in tighter cash flow conditions among developers, which are typically owners of commercial properties. This could then adversely impact other subsectors within the construction sector and other related industries. Already, the construction sector’s growth rate moderated to 8.2% in 2015 from 11.8% in 2014. This was mainly due to slower activity in residential developments but offset by ongoing infrastructure projects. “Further weakness in these related sectors could potentially affect employment prospects, impacting the ability of some households to service their loans,” says Bank Negara. At the moment, households’ ability to repay loans does not appear to be a problem. Gross impaired loans and gross delinquent loans for purchases of residential and non-residential properties fell in the last three years. Bank Negara data shows the ratio of gross impaired loans for residential property purchases fell to 1.1% in 2015 from 1.2% and 1.3% in 2014 and 2013 respectively. Gross delinquent loans ratio for purchases of residential properties dropped to 1.5% in 2015 from 1.8% and 2.1% in 2014 and 2013 respectively. Nevertheless, household indebtedness remains at a high level — 89.1% of gross domestic product. Yet, some market observers are cautious about a prolonged property downturn, which they fear could hit domestic financial institutions. According to Bank Negara data, the total exposure of Malaysian financial institutions to the domestic property market stood at RM733.4 billion. This amount represented 25.7% of total financial system assets at the end of last year, slightly higher than the 24.1% in 2014. Bank financing for residential properties saw 11.7% growth last year, a more tempered pace in line with slower growth in the housing market.